In order to prepare Curiosity for its trip to Mars, NASA had to pull out all the stops. Because the rover’s payload is 10 times as massive as those of earlier rovers, it would enter the Martian atmosphere at speeds of more than 13,000 miles per hour—1,000 miles per hour faster than its predecessors. To decelerate the giant laboratory on wheels, NASA had to construct the largest supersonic parachute ever built for a mission; to prevent the ensuing rocket thrust from kicking up dust on sensitive equipment, a first-of-its-kind sky crane was created to gently lower the machine onto the ground. And that is only the oversimplified version of the landing sequence. Yet for all the planning and development that went into the rover’s landing gear, its suite of scientific instruments, and its thermo-nuclear power generator—to name only a few components—the agency’s lofty goal of sending humans to the Red Planet presents still greater technological and logistical challenges. The fact that Curiosity’s mission is to discover if Mars was ever capable of supporting life hints at one of the agency’s major obstacles in pulling off a human mission: developing dependable astronaut life support systems for a planet that—despite its many similarities to Earth—is bereft of even so much as a breathable atmosphere. Then there are logistics such as the kinds of propulsion and power systems to be employed, whether payloads should be brought on separate flights, how habitation units should be designed, and so on. 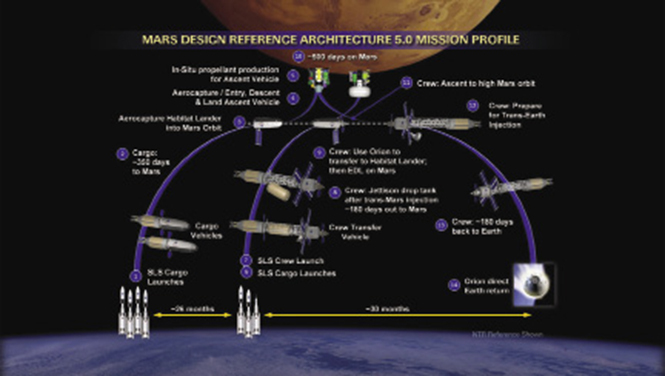 An example of a Design Reference Architecture summary for a human mission to Mars. Ed Crawley and his team at Massachusetts Institute of Technology developed an algorithm-based software tool to help NASA choose the most cost-effective and efficient architectures, or systems of technologies, for what will be one of humankind’s greatest achievements. To add to the complexity, each technology decision has to be made in relation to how it would impact other technologies being considered. Having to evaluate a multitude of components in relation to each other makes for an overwhelming number of possible systems, or architectures. To incorporate a logistical framework for such an undertaking, throughout the 2000s NASA Headquarters awarded research grants to Massachusetts Institute of Technology (MIT), with Ed Crawley, Ford Professor of Aeronautics and Astronautics at the university’s department of the same name, serving as principal investigator. A systems engineer and former astronaut candidate, Crawley had had a long, distinguished history of working with the agency on lunar and Earth-observing missions. He and his team of graduate students would ultimately develop an algorithm-based tool that evaluates the various tradespaces—or design combinations—and comes up with the best options. Arriving at those best options was accomplished by mathematically analyzing the thousands of possible tradespaces and deriving what’s called the Pareto frontier: tradespaces that are the most promising in terms of cost and mass while also offering the highest chances for success. On a Pareto graph, mass is charted on the vertical axis; cost on the horizontal. The frontier is represented by dots—each representing a tradespace—that populate the edges, denoting the plans that use up the least amount of cost and mass. NASA is using that data to help guide its decision-making. The tool not only helps determine the most efficient technologies but also advises the agency on how to prioritize their development. “Investment decisions made in the right order might save you time, money, and a lot of headaches,” says Suzuki. For example, an oxygen processing plant developed for use on Mars would obviate the need for allocating space and mass for huge oxygen tanks onboard the spacecraft. One major step NASA has taken because of the tool’s analysis is the decision to further develop technologies that support the use of liquid hydrogen as a fuel source. “We looked at all these thousands of ways to go to Mars, and no matter which way we choose, we know we’re going to need this technology because of its high performance and efficiency,” Suzuki says. Using these tools for figuring out the most sensible plan of attack for a complex project would work well not only for space missions, as Crawley found out, but also for home construction. 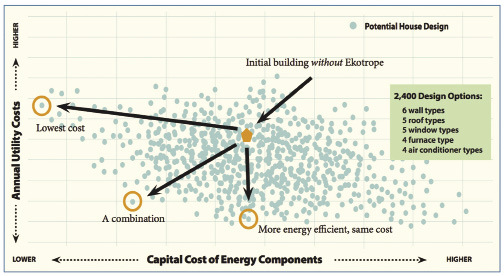 He was looking to build an energy-efficient and cost-effective home for himself, and he realized there was no sufficient way for his architect to analyze how different combinations of components impacted the trade-off between cost and energy efficiency. Inspired by his NASA experience, in 2010 Crawley and his team at MIT developed a Pareto frontier-based software program called Ekotrope, which he used to not only construct his home but also start a business. For anyone who has ever been involved in designing and building a home with both cost effectiveness and energy efficiency in mind, the virtually endless number of construction methods can be overwhelming. “Manually trying to figure out optimal combinations of windows, walls, insulation levels and materials, HVAC systems and so on is too complicated and time-consuming,” says Ekotrope CEO Ziv Rozenblum. But just like the Mars-oriented software tool, Ekotrope analyzes the numerous design options to arrive at the most promising architectures. All a builder needs to do is input into the cloud-based program known parameters for the future house, such as its interior and exterior dimensions, the potential materials (there is an extensive drag-and-drop menu that’s always being updated), and its orientation. By utilizing his work with NASA, Crawley developed Ekotrope, a software tool that helps homebuilders narrow down the thousands of design options to the ones that are the most cost- and energy-efficient. The software takes that information and runs it against a year’s worth of local weather data for the area. It quickly produces a graph with the vertical axis representing annual energy costs and the horizontal axis the total cost for building components and equipment. The graph contains thousands of dots representing all possible design options. But as with the Mars analysis, the builder need only pay attention to the Pareto frontier: the set of dots that populate the edges where either energy or construction costs, or both, are low. A builder can then choose from those options based on specific cost, energy efficiency, and design considerations. In the few years since its founding, the Cambridge, Massachusetts-based company has seen steady business growth, with residential construction firms drawn to Ekotrope’s ease of use and ability to help builders meet energy codes cost-effectively. Another benefit is that builders are also equipped with the ability to display to prospective owners the financial benefits of energy-efficient improvements. As an example, a builder in Florida is using Ekotrope to improve design and demonstrate a less than one-year payback on a super-efficient house which, under normal usage, has zero utility costs. The technology’s genesis couldn’t have come from a more audacious undertaking: sending humans to Mars.